A former White House supervisor is facing a federal criminal charge, accused of doctoring time sheets and pocketing taxpayers' money, according to FBI records obtained by the News4 I-Team. Andrea Turk is scheduled to appear in D.C. federal court Thursday afternoon for a preliminary hearing on a charge of theft of government property. According to the FBI records, Turk executed a scheme to manipulate time sheets for personal gain while serving as a manager who oversaw and approved time sheets and employee work schedules at 1600 Pennsylvania Avenue. Turk -- who was fired from her job at the White House in 2013, according to court records -- served as White House Director of Information Services beginning in 2009. She supervised a staff of 15 while serving in the post, earning $85,000 per year. Her employees were switchboard operators, according to FBI records. An FBI special agent said one of those employees was victimized in Turk's scheme, court records show. Investigators said Turk insisted an employee accept extra, unearned overtime pay, and then funnel the proceeds back to Turk. "(The employee) initially responded that she did not want to assist Turk in this manner and suggested that Turk seek financial assistance or ask for a loan," the FBI affidavit said. "When (the employee) also expressed concern that she and Turk would be discovered and get into serious trouble, Turk replied that the Human Resources department did not pay attention to such issues and would never discover their conduct." According to court records, the FBI said the scheme occurred during 20 pay periods between 2012 and 2013, indicating it likely generated thousands of dollars for Turk. The records indicate Turk's employee was able to keep some of the proceeds of the time-sheet doctoring but also said the employee felt "obligated" to perform personal favors for Turk. Those favors included babysitting and picking up Turk's child from daycare. 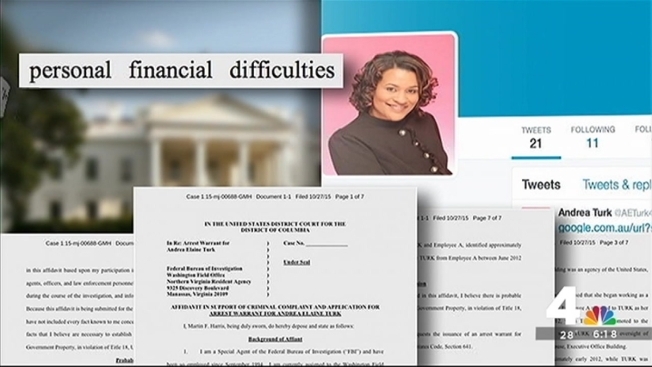 Turk had expressed concerns about her own financial well-being, according to FBI agents. Turk did not immediately return messages seeking comment. "When we became aware of the facts described in the complaint we took appropriate personnel actions, including terminating the employee, and referred the matter to the Department of Justice," a White House official said. "With respect to any questions about the law enforcement investigation, we would direct you to the Department of Justice." The FBI records detail how agents describe the operation of the alleged scheme. "(The employee) made the first payment to Turk in cash," the records said. "Following the initial cash payment, Turk requested that Employee A make future payments via online wire transfers, directly from (the employee's) bank account to Turk's bank account. Turk provided Employee A with her bank account information." The court records do not specify the identity of the other employee referenced in the FBI investigation. The FBI declined requests for comment on the case, including whether that employee is also under investigation.